The Kansas Republican Party is filled with characters on the inside. I'm looking through the window and holding up a mirror. 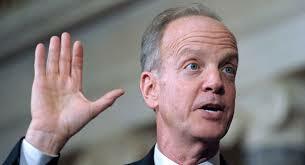 Sen. Jerry Moran will seek re-election in 2016. Not that we didn't know it anyway, but for those wondering: Moran is raising funds and has apparently identified county chairs for his re-election campaign. The Moran campaign announcement doesn't include the names of these chairs, so I guess we're going to have to take Moran's word for it. Of the 105 chairs, the release says more than a dozen are former and current local elected officials. Others come from a wide variety of industries including health care, pharmacy, education, agriculture, aviation and banking. He does mention names in Kansas' most important counties. Johnson County Co-Chair is Peggy Dunn. (Meh.) Bob Dool will serve as Sedgwick County Chair. Joe Patton will chair Shawnee County efforts. The release also gives a nod to out-there Kansas. Mary Soukup is Ellsworth County Chair. If re-elected, this will be Moran's second term in the Senate. Prior to entering "public service" Moran was an attorney. (Puke.) He served eight years in the Kansas Senate. In 1996, he was elected to the U.S. Congress, representing the Big First. And of course, the wounds from his 2010 primary election against Todd Tiahrt for the U.S. Senate have yet to heal. Moran is quickly approaching the outer limits of how long it is acceptable to stay in Washington. Perhaps most damagingly, Moran chaired the National Republican Senatorial Committee from 2012-2014. Some would call this an advantage. Under his tenure, the Republicans added 9 Senators, giving the GOP its largest majority since 2006. There's blood on Moran's hands for the way some of those seats were earned. (See Thad Cochran's Mississippi race for the Senate, a truly shameful chapter in Republican history.) And then there's the actual effort of this so-called Republican majority in the U.S. Senate. I'm going to call it a bust. Is that Moran's fault? He definitely gets a share of the blame. I haven't heard of anyone planning to run against Moran. He will be incredibly difficult to beat. You can't swing an elbow in Kansas without hitting Jerry Moran. To his credit, he is always here, always available. Take heart, pro lifers. We will win this. All content copyright Gidget S.. Simple theme. Powered by Blogger.